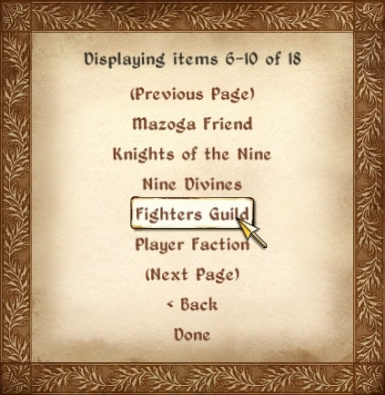 Powerful in-game tool for finding reference and object IDs, and browsing NPC inventory, spells, factions, and more. Also tells you whether containers are safe for storage. In order to ensure that anyone looking for RefScope finds the latest version, I would prefer that it not be posted in places that I can't update when a new version is released. However, I can't foresee everyone's needs, so if you feel you have a good reason to redistribute this mod, you may do so. 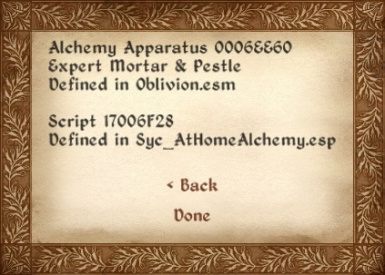 If possible, please contact me before doing so, so that I'm aware of any other places where RefScope may be found besides here and on Planet Elder Scrolls. If you would like to make improvements to RefScope, you may modify it and distribute your modified version, provided that you call it something other than "RefScope", and clearly state (e.g. in documentation) that your modified version is based on RefScope. However, I'd rather not see RefScope forked unnecessarily, so if you're thinking about releasing a modified version, please contact me first to see if your changes can be incorporated into the official version instead. 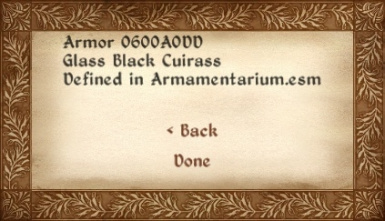 Have you ever come across an unusual building, item, or NPC in the world of Oblivion and wondered whether it was part of the original game or added by a mod, and if so, which one? Or wondered where that NPC got his cool armor that you've never seen before? 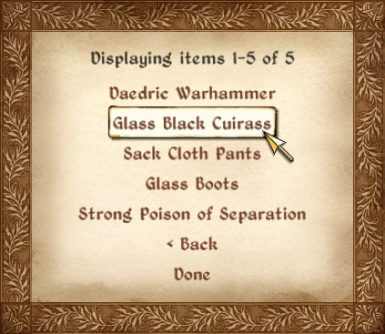 If you play with a lot of mods, it's easy to lose track of all the content that each one adds to the game. Sometimes (hopefully not too often) you might even get a big yellow warning sign telling you that something's missing because one of those mods isn't properly installed, and you want to know which one it is so that you can fix it. All this information can be valuable in resolving conflicts, debugging mods, or just keeping track of where your game content is coming from. The basic way to use RefScope is to hold the X key, look at an object, and press the Activate key (typically the spacebar) for information about the object. Hold the X key and press the Cast key (typically C) for information about your own character instead. 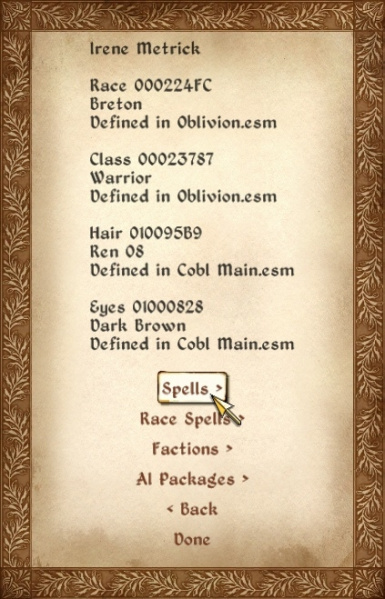 You can get information about objects and spells in many of the game's built-in menus (such as your inventory window), by pointing at the item, holding X, and pressing Activate. Map markers on the world map can also be activated in this way. 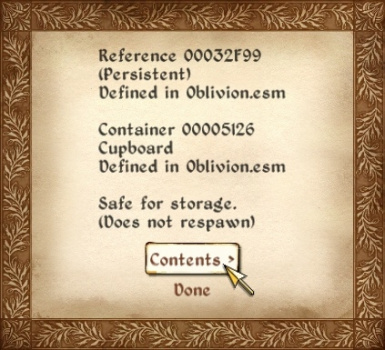 Requires OBSE (Oblivion Script Extender) v0019 or later. Optional logging feature requires ConScribe or Pluggy.